"Proposed Rulemaking To Establish Light-Duty Vehicle Greenhouse Gas Emission Standards and Corporate Average Fuel Economy Standards"
The document contains a very useful summary of past conversations about supplementing MPG with a measure of fuel consumption. 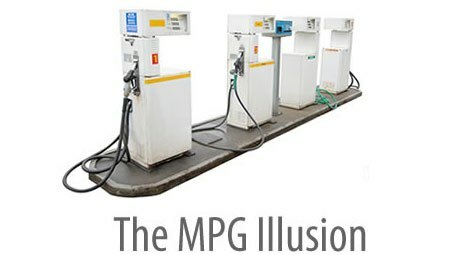 I have cut and pasted three sections on how consumers think about MPG. Page numbers refer to the Federal Register numbering. The passages appear below. • Submit your comments on line at this link. In 2006 EPA redesigned the window stickers to make them more informative for consumers. More particular, the redesigned stickers more prominently feature annual fuel cost information, to provide contemporary and easy-to-use graphics for comparing the fuel economy of different vehicles, to use clearer text, and to include a Web site reference to www.fueleconomy.gov which provides additional information. In addition, EPA updated how the city and highway fuel economy values were calculated, to reflect typical real-world driving patterns.187 This rulemaking involved significant stakeholder outreach in determining how best to calculate and display this new information. The feedback EPA has received to date on the new label design and values has been generally very positive. During the 2006 label rulemaking process EPA requested comments on how a fuel consumption metric (such as gallons per 100 miles) could be used and represented to the public, including presentation in the annual Fuel Economy Guide. EPA received a number of comments from both vehicle manufacturers and consumer organizations, suggesting that the MPG measures can be misleading and that a fuel consumption metric might be more meaningful to consumers than the established MPG metric found on fuel economy labels. The reason is that fuel consumption metric, directly measures the amount of fuel used and is thus directly related to cost that consumers incur when filling up. The problem with the MPG metric is that it is inversely related to fuel consumption and cost. As higher MPG values are reached, the relative impact of these higher values on fuel consumption and fuel costs decreases. For example, a 25 percent increase in gallons per 100 miles will always lead to a 25 percent increase in the fuel cost, but a similar 25 percent increase in MPG will have varying impacts on actual fuel cost depending on whether the percent increase occurs to a low or high MPG value. Many consumers do not understand this nonlinear relationship between MPG and fuel costs. Evidence suggest that people tend to see the MPG as being linear with fuel cost, which will lead to erroneous decisions regarding vehicle purchases. Figure III.E.11–1 below illustrates the issue; one can see that changes in MPG at low MPG levels can result in large changes in the fuel cost, while changes in MPG values at high MPG levels result in small changes in the fuel cost. For example, a change from 10 to 15 MPG will reduce the 10-mile fuel cost from $2.50 to $1.60, but a similar increase in MPG from 20 to 25 MPG will only reduce the 10-mile fuel cost by less than $0.30. Because of the potential for consumers to misunderstand this MPG/ cost relationship, commenters on the 2006 labeling rule universally agreed that any change to the label metric should involve a significant public education campaign directed toward both dealers and consumers. In 2006, EPA did not include a consumption-based metric on the redesigned fuel economy label in 2006. It was concerned about potential confusion associated with introducing a second metric on the label (MPG is a required element, as noted above). EPA has developed an interactive feature on www.fueleconomy.gov which allows consumers, while viewing data on a specific vehicle, to switch units between the MPG and gallons per 100 miles metrics. The tool also displays the cost and the amount of fuel needed to drive 25 miles. As indicated above, however, EPA is alert to the problems with the MPG measure and the importance of providing consumers with a clear sense of the consequences of their purchasing decisions; a gallon-per mile measure would have significant advantages. EPA plans to seek comment and engage in extensive public debate about fuel consumption and other appropriate consumer information metrics as part of a new labeling rule initiative. EPA also welcomes comments on this topic in response to this GHG proposal. Considerable research suggests that the Energy Paradox is real and significant due to consumers’ inability to value future fuel savings appropriately. For example, Sanstad and Howarth (1994) argue that consumers optimize behavior without full information by resorting to imprecise but convenient rules of thumb. Larrick and Soll (2008) find evidence that consumers do not understand how to translate changes in miles-per-gallon into fuel savings (a concern that EPA is continuing to attempt to address).335 If these arguments are valid, then there will be significant gains to consumers of the government mandating additional fuel economy. The evidence from consumer vehicle choice models indicates a huge range of estimates for consumers’ willingness to pay for additional fuel economy. Because consumer surplus estimates from consumer vehicle choice models depend critically on this value, EPA would consider any consumer surplus estimates of the effect of our rule from such models to be unreliable. If there is a difference between fuel savings and consumers’ willingness to pay for fuel savings, the next question is, which is the appropriate measure of consumer benefit? Fuel savings measure the actual monetary value that consumers will receive after purchasing a vehicle; the willingness to pay for fuel economy measures the value that, before a purchase, consumers place on additional fuel economy. As noted, there are a number of reasons that consumers may incorrectly estimate the benefits that they get from improved fuel economy, including risk or loss aversion, poor ability to estimate savings, and a lack of salience of fuel economy savings. Considerable evidence suggests that consumers discount future benefits more than the government when evaluating energy efficiency gains. The Energy Information Agency (1996) has used discount rates as high as 111 percent for water heaters and 120 percent for electric clothes dryers.343 In the transportation sector, evidence also points to high private discount rates: Kubik (2006) conducts a representative survey that finds consumers are impatient or myopic (e.g., use a high discount rate) with regard to vehicle fuel savings.344 On average, consumers indicated that fuel savings would have to pay back the additional cost in only 2.9 years to persuade them to buy a higher fuel-economy vehicle. EPA also incorporate a relatively short ‘‘payback period’’ into OMEGA to evaluate and order technologies that can be used to increase fuel economy, assuming that buyers value the resulting fuel savings over the first five years of a new vehicle’s lifetime. This assumption is based on the current average term of consumer loans to finance the purchase of new vehicles. That said, there is no consensus in the literature on what the private discount rate is or should be in this context. A detailed discussion of the state of the art of consumer choice modeling is provided in the DRIA. For this rulemaking, EPA is not able to estimate the consumer welfare loss which may accompany the actual fuel savings from the proposal, and so any such loss must remain unquantified. EPA seeks comments on how to assess these difficult questions in the future.